LITTLE ROCK, Ark. (March 3, 2012) – Hall of Famer, Arkansas native and friend of Bill Clinton, Lou Brock helped to open an exhibit at the Clinton Libary on Friday that features of the best artifacts the St. Louis Cardinals own from their history. “Play Ball! The St. Louis Cardinals” opens today at 9 a.m. and will be a featured part of the William J. Clinton Presidential Library through September. 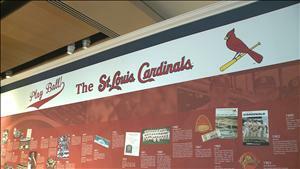 The exhibit features more than 100 items from the Cardinals’ Hall of Fame Museum, a collection the team owns and has improved in recent years despite not having a place to publicly display it. “This is going to be something that kids, adults, women, men, baseball fans, non-baseball fans alike will all enjoy,” says Jordan Johnson, spokesperson for the Clinton Foundation. Among the items that the Cardinals lent to the library are several Dizzy Dean-related artifacts as well as the trophies from the 2006 and 2011 World Series. The exhibit runs through Sept. 16 and is included in the price of admission. Admission to the Clinton Library is $7 for adults, $5 for seniors and students, $3 for kids and free for children 5 and under.